Jair Bolsonaro's election in Brazil marked the decline of trade unions as the primary site of working-class organization; and the rise of Evangelical churches in their place. Jair Bolsonaro, since winning the presidency in the most unpredictable election in Brazilian history, has been striving to end an era where citizens combined material progress with social protection. His government has already eliminated the Ministry of Labor, weakening the institutions responsible for labor regulations, like the Public Ministry of Labor (MPT) and the Labor Court. In addition, he proposed a strengthening of previous president Michel Temer’s counter-reforms, such as the labor reform and the law on the ceiling of public expenditures (a law that froze public spending for twenty years). Bolsonaro’s government will create a new “green-and-yellow” work card, replacing the “blue” one, without any of the labor guarantees provided by the Consolidation of Labor Laws (CLT). The worker who “opts” for the green-and-yellow card would be subject to direct negotiation with companies, with no mediation by unions. This worker could possibly have constitutional rights, such as paid leave and Christmas bonus, suppressed in the negotiation process. The pretext is always “job creation.” Now that a year has passed since Temer’s initial counter-reforms, we can assess whether this repression of labor rights has indeed led to more jobs. The data in this regard is damning: in February 2019, the unemployment rate was 12.4 percent, totalling 13.1 million unemployed, versus 12.5 percent in January 2017. Despite the slight increase in the number of employed workers, it is worth noting that most of these new occupations were generated within the informal labor market, where there was an increase of 528,000 people working independently and 498,000 employees from the private sector without work cards. In addition, the rate of under-utilization of the workforce — workers who could be working longer hours — reached 24.6 percent, with 27.9 million people in this group. This contributed to stagnating wages across the board in 2018. Meanwhile, the new ceiling of public spending bill did not prevent deterioration of the public sector net debt amid the slowest economic recovery in Brazilian history. Since Brazil’s re-democratization in 1988, redistributive agendas have mostly been more likely to win elections. This was especially true for the successive electoral victories of Workers’ Party (PT) candidates from 2002 onwards. That is not surprising, given the gulf between the rich and the poor in Brazil. Since the poor make up the majority of voters, it is reasonable to assume that they will tend to vote for candidates who promise to mitigate social inequalities, particularly income inequality. Even if we consider the 1990s election of Fernando Henrique Cardoso, whose political project combined neoliberal policies with social forces that fought against the dictatorship and for Brazilian democracy, his plan for economic stabilization known as Plano Real was an important redistributive moment for the working poor who were unable to protect themselves from runaway inflation. The election of Jair Bolsonaro in 2018 set up a sharp change of direction in Brazilian politics. 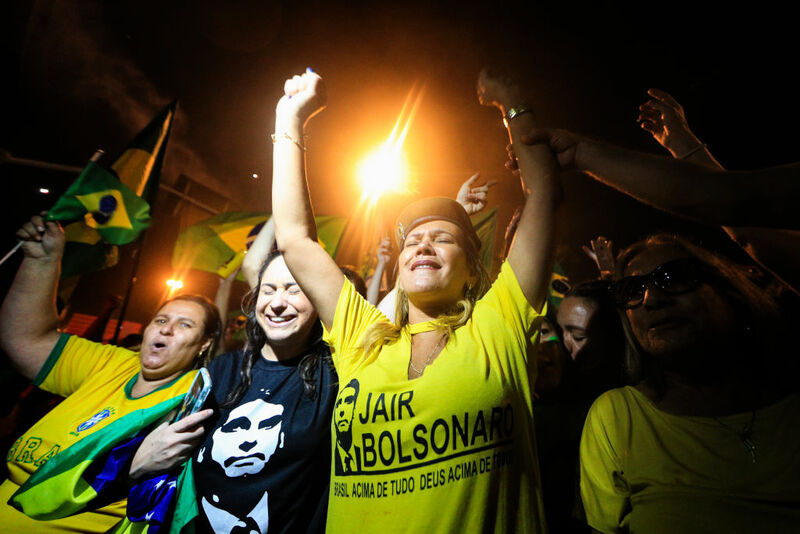 Whether Bolsonaro will be able to effect a lasting political realignment is uncertain, considering his cratering popularity. How should we understand that in a country as unequal as Brazil, a substantial part of the working class chose a candidate clearly opposed to a redistributive agenda and who promised to attack social security and labor rights? First of all, let us dismiss the analyses that tried to explain Bolsonaro’s election through an avalanche of fake news during the last weeks of his electoral campaign. It’s true that the use of fake news was widely used in Bolsonaro’s campaign. But this hypothesis simply does not explain why, for another eight months, candidate Jair Bolsonaro led opinion polls when the favorite, Luiz Inácio Lula da Silva, was not mentioned to responders. The second hypothesis points to the reaction of the electorate, mostly white middle-class men, to the recent advances in feminist, black, and LGBT struggles. Seeing a threat to their gender and social class privileges, this part of society would have reacted, affirming once again their historical truculence by electing someone that represents them. There’s some truth to this hypothesis, but it underestimates Bolsonaro’s large number of votes from women (41 percent of valid votes), black and mixed race people (41 percent of total votes) and low-income groups concentrated in families that receive between two and five minimum wages (61 percent). In addition, this hypothesis tends to downplay the importance of the support Bolsonaro received from non-denominational evangelical churches (59 percent of the total votes, against only 26 percent of the votes for Haddad, according to Datafolha), without which, according to most political analysts, he would probably have lost the second round to the Workers’ Party candidate. A series of deeper processes gradually unfolded in the decade prior to Jair Bolsonaro’s election, which are necessary to understand the rise of the far right in Brazil, especially its appeal among those from families whose average income is concentrated in the range between two and five minimum wages. That is a huge portion of the population, corresponding to more than a third of the electorate, which had since 2002 usually voted for PT candidates. But this changed dramatically in 2018: 61 percent of voters in this income range opted for Bolsonaro, while 39 percent of voters chose candidate Fernando Haddad. The very poorest voters — those living in families that receive two minimum wages or less — remained loyal to the PT. Those with relatively higher incomes, however, opted for Bolsonaro. We can infer, then, that the changing loyalties of those who receive between two and five minimum wages — in other words, low income, but not desperately poor people — is what explains the election of the PSL candidate. The political scientist André Singer and sociologist Gustavo Venturi convincingly argue that low-income support for the ultra-right candidate stemmed from his emphasis on public safety –– a real concern in a country that sees constant street crime and over sixty thousand murders a year. Singer and Venturi are correct to identify the problem of social violence as a trigger for Bolsonarism among people whose family incomes range from two to five minimum wages. Nevertheless, it is necessary to understand the background reasons that led this important part of the Brazilian electorate to abandon the PT and adhere to the PSL candidate’s “necropolitical” discourse. Our hypothesis is that if fear of crime was the immediate cause of low-income groups’ support of Bolsonarism, the profound cause was the global tendency of frustration, particularly prominent among precarious and informal workers living in large urban centers, with the limits (political, economic, and ethical) of the mode of development championed by former PT president Lula da Silva. Lula, over the course of his enormously popular back-to-back terms, forged a unique approach to development and political economy now known as Lulismo. The former president was imprisoned on trumped-up corruption charges and barred from running against Bolsonaro last year. Yet the legacy of his governments continues to dominate the Brazilian political imaginary, for his supporters and opponents alike. Lulismo was defined by the way it aimed to stabilize social conflict in Brazil. Between 2003 and 2013 it forged two different forms of consensus. First, a form of passive consensus among the subaltern classes who were attracted to the PT’s distributivist public policies, such as the Bolsa Família program and the policy of valorization of the minimum wage. Second, the PT constructed an active consensus among the leaders of the main social movements in the country. Despite the neoliberal macroeconomic policy advocated and sustained by the PT governments, the conjunction of these two forms of consent was able to guarantee the strengthening of certain policies compatible with the project of building a wage society in Brazil. Of course, the limits of Lulismo were revealed when the international economic crisis put an end to the commodity super-cycle that had benefited the Brazilian economy during the PT governments. The contradictions of Lulismo are a contentious theme. Among São Paulo’s call center workers, for instance, I observed a growing frustration that expectations of social mobility — fueled by the double expansion of precarious work and consumer credit — were not being met. Encouraged by public PT policies such as consigned credit, minimum-wage raises, and the Minha Casa Minha Vida program (“My House, My Life,” or MCMV) precarious workers started to consume previously inaccessible goods and services. However, the increased consumption was due to the increase in the indebtedness of working families. Hence the reason why many workers do not recognize the importance of Lulista policies in their lives, preferring to attribute the economic progress to their own efforts. The popularity of certain policies, such as Bolsa Família or university racial quotas, strengthened a backlash from those precarious workers who, living in the informal sector or receiving low wages, did not directly benefit. In the eyes of many of these workers, the public policies of the PT era have done nothing more than stimulate laziness and political clientelism, transforming citizens into parasites and objects of electoral exploitation by corrupt politicians. The Brazilian far-right managed to instrumentalize this feeling through the rhetoric of “meritocracy,” appealing to popular resentment against the PT as the crisis deepened and decimated jobs. Indebted during the heyday of Lulismo, many of these precarious workers’ families moved to more distant outskirts of cities, becoming increasingly dependent on notoriously inefficient public services. In short, from the perspective of the Brazilian subaltern classes, the social progress they experienced was real but ambiguous. There was an increase in working families’ consumption; but it came at the expense of indebtedness. There was an increase in worker protection through formalization of employment, but at the expense of outsourcing and low wages. There was a decrease in the housing deficit, but at the expense of urban territorial segregation and increased dependence on inefficient public services. Despite the ambiguity, the way families that receive between two and five minimum wages related to the PT project remained stable until Dilma Rousseff’s government applied neoliberal measures at the beginning of its second term, creating an economic recession that would soon prove to be the worst in the country’s recent history. Between 2015 and 2016, the country’s GDP decreased by 7 percent and unemployment almost doubled, from 6.8 percent in 2015, to 12.8 percent in 2017. Without minimizing the importance of the disastrous strategic choices of Dilma Rousseff’s second term — among which was the adoption of a contractionary policy that worsened the recession — it was the combination of political crisis and economic crisis that devastated the PT government. We shall not dwell on the evolution of the crisis that culminated in the impeachment without crime of responsibility by President Dilma Rousseff. However, it is worth observing that, very likely, the government would not have fallen if there had not been a cycle of popular upheavals, fed by the subaltern classes’ disillusionment with the policies put in place during Dilma Rousseff’s second term. With the deepening of the economic crisis between 2015 and 2016, disillusionment with the PT government quickly turned into a more or less noisy wave of popular resentment that, fueled in part by rising unemployment, overflowed into a wave of social rage against the then governing party. Not even the historic unpopularity of now-imprisoned Michel Temer’s government was able to reverse this well-settled feeling among those affected by unemployment. The real question we are trying to answer is: what is the sociological foundation for this popular anti-PT sentiment that ended up concentrated in the groups that receive between two and five minimum wages? Here, it is important to present some observations based on research by the Center for Studies of Citizenship Rights’ (CENEDIC) and scholars like Rosana Pinheiro-Machado and Esther Solano, who study the electoral phenomenon of Jair Bolsonaro from the perspective of subaltern groups of Brazilian society. Firstly, in the second half of the 2000s, that is, at the height of Lulismo, data was collected in field surveys on the outskirts of the city of São Paulo. The results pointed loss of prestige by labor unions as benchmarks for collective organization, as outsourced and cooperative work increased. Peripheral collective identities came, then, to be increasingly shaped by neo-Pentecostal evangelical churches rather than by unions. At the same time, as the research progressed, it revealed that, at least in the city of São Paulo, public health and social assistance policies created during the Lula government were being managed by social organizations controlled by evangelical churches. For the recipients of these public policies, evangelical churches were more often associated with the Bolsa Família program or even with the role of community health agents than with the distant federal government. In summary, we can conclude that the Lula era was a period that associated modest but effective material progress, and a certain decrease in income inequality among workers, with a weakening of collective identities based on formal employment, especially by trade unions. Surprisingly, the neo-Pentecostal evangelical movement was the one that benefited the most in organizational terms from the Lulista hegemony. According to data from the 2010 census, its growth went from 15.4 percent in 2000, to 22.2 percent in 2010 (see table below). This is different from what happened in the 1970s, when the flourishing of religiosity in grassroots communities occurred pari-passu with the strengthening of union power. Now a rather different theology is taking root in the sphere of low-income groups: the neo-Pentecostal theology of prosperity — a variant of US televangelism in which achieving grace correlates to the satisfaction of individual desires for protection and material prosperity. While the trade union movement was the driving force behind the “era of democratic inventions” (to recall sociologist Chico Oliveira’s expression) of the 1970s and 1980s, the neo-Pentecostal movement today flourishes in a context of dismantling of labor protections, strengthening in low-income groups a subjectivity clearly aligned with the model of neoliberal self-management. The mediation between the worker and the world of work ceases to be predominantly collective and begins to take refuge in the formulas of popular entrepreneurship. And with the approval of the counter-reform in 2017, union power shifted irreversibly to a defensive position. The most iconic image of the weakening of of Brazilian trade unionism in the face of the power of neo-Pentecostal churches was the sale of the Unified Workers’ Central (CUT) in the Brás neighbourhood of São Paulo, an imposing seven-story building that housed the central for twenty-three years, to the World Church of the Power of God (IMPD) led by the “apostle” Valdemiro Santiago, a televangelist who broke, in the late 1990s, with the Universal Church of the Kingdom of God (UCKG), led by Bishop Edir Macedo, the most powerful capo of Brazilian neo-Pentecostalism. Of course, the erosion of the bases of trade unions cannot be explained solely by the advance of neo-Pentecostalism. However, the combination of the growing influence of neo-Pentecostalism in grassroots milieus and the crisis of formal employment revealed the unprecedented scale of the dismantling of wage citizenship in the country. The current trend is that social protection, now interpreted as protection of “traditional family values,” is “privatized” and “outsourced” to evangelical churches, demonstrated by the creation by the Bolsonaro government of the “Ministry of Family” led by a fundamentalist pastor. The historical process by which trade unions lead collective mobilization for labor protections, is being absorbed by the neo-Pentecostal movement in a privatized model — that is, circumscribed by the family domain. Of course, we are referring to a still-young process with contradictory characteristics. Besides, non-denominational neo-Pentecostalism is pluralistic, not limited to the most successful churches in political and business terms, such as the Universal Church of the Kingdom of God (UCKG). In its authentically popular versions, this strand of Christianity can develop certain elective affinities with the social movements of the working poor, like the Homeless Workers Movement (MTST), for example, whose grassroots militancy is formed mostly by neo-Pentecostal evangelical believers. In addition, the decline of the Brazilian Fordist and peripheral working class did not succeed in stopping trade unionism from being a politically relevant player. Indeed, it is still possible to identify strong links between the current demands of workers for labor rights and better wages; with the history of the formation of a Fordist working class, subjected to the super-exploitation of work and struggling to realize the social rights existing in the Law but denied in the daily practice of the companies. Studying the cycles of strikes of the populist period and their resurgence during the Brazilian civil-military dictatorship, I myself analyzed the history of the formation of this working class during the 1950s, 1960s, and 1970s in my book The Politics of the Precariat. In 2017, for example, we observed a considerable number of strikes (1,566 strikes, 814 in the public sphere and 746 in the private one), though strike rates were lower than the previous year (in 2016 there were 2,093 strikes, 1,100 in the public sphere and 986 in the private one) and with equally defensive characteristics. But it is undeniable that the global flow of events favors a shift in collective forms of popular organization from the trade union movement to the neo-Pentecostal movement. From the frustrated expectations around material progress and social protections of the Lulista era, we have reached the current context marked by fears — widely recorded by opinion polls — of unemployment and social violence. And the meeting of one fear with another happened in the streets: when one worker loses his or her job and fails to return to the formal job market, he or she is left with underemployment, usually as a street vendor. From the private space provided by factories or offices, relatively protected from social violence, we pass into the public space of competition over small businesses in the informal labor market. It should be noted that, from the first to the second quarter of 2018, the number of newly employed persons in the Brazilian labor market reached six hundred thousand. However, from this total number, 74 percent of the occupations were informal and 86.2 percent did not contribute to social security. Of the newly employed, 71 percent were concentrated in twenty occupations, most of which related to services or sales activities, with firsthand salespeople at the top of the list (281,000). The average income of these new employees is less than half of the market’s average pay. In a low-income milieu increasingly exposed to the advance of unemployment, underemployment, and informality, it is not surprising that politicized collective relationships — like the trade union movement — are weakened in favor of competitive relations linked to the occupation of sales areas, as well as by the growing fear of urban violence. If trade unionists have become distant from the everyday lives of the subaltern classes, becoming less important to informal workers, it is relatively easy for a far-right candidate to associate them, for example, to the corrupt schemes of a political system in crisis, including them in the group of “good-for-nothings” who are “destroying the country.” The solution then is “to put an end to good-for-nothingness.” That is, eliminate criminals and the corrupt. The electoral phenomenon represented by Jair Bolsonaro in Brazil will still be subject to much debate in the social sciences. His presidential election campaign was undoubtedly the most unusual in the history of the republic. The details of Lula’s arrest, of the stabbing of Bolsonaro in Juiz de Fora, of the use of fake news via WhatsApp, etc., all highlight the unique character of the latest presidential election. However, any interpretation which disregards the importance of the relation between candidate Jair Bolsonaro and the subaltern classes, especially the evangelical sector, will lose its explanatory power. Ruy Braga is an associate professor at the Department of Sociology of the University of São Paulo.